Eco-Hostal Tambo Verde, Santiago, Chile : Rezerwuj teraz! For group bookings or long stays, we request the advance payment of at least 50% of the total value of the reservation. The payment term depends on the season, the size of the group or importance of the stay. Group or long-stay reservations already paid are not refundable. Hi everybody! 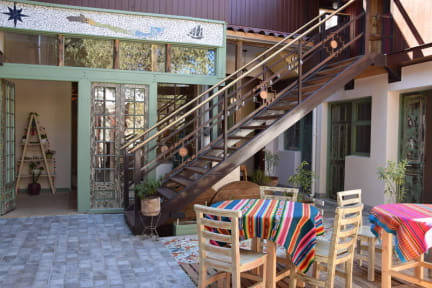 We are a new charming and familiar hostel in the Chilean capital. First and foremost, we want to be a cosy and comfortable place of encounter and exchange between persons and cultures. Furthermore, we try to be environment-friendly and want to commit ourselves to a more responsible and sustainable tourism. Our hostel is situated in the capital’s trendy Bellavista neighbourhood, within an area declared historic monument. With a privileged location, right at the foot of the emblematic San Cristobal hill and only a few minutes from metro stations, you get quick access to the main areas of interest Santiago has to offer. 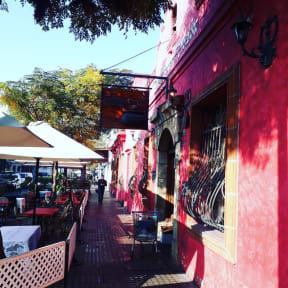 Within just 5 minutes walking you will arrive at the 'center' of our neighborhood, with its bohemian flair and nightlife, its bars, restaurants and cultural and historical attractions. We have 10 comfortable rooms, each with its own style and design. We offer different types of rooms, so that each of our passengers can find the ideal form of accommodation according to her or his needs. First and foremost, we want to be a cosy and comfortable place of encounter and exchange between persons and cultures. Furthermore, we try to be environment-friendly and want to commit ourselves to a more responsible tourism.